From grime busting bathroom and kitchen products to air fresheners specially formulated to keep rooms smelling lush for hours on end we stock an extensive selection of wholesale cleaning products to help your customers achieve a spotless home. Order online by 12pm and in most cases your wholesale cleaning items will be delivered the next day. Call us on 01254 306840 if you can't find what you're looking for or require more information. Helping your customers fight grime, cover smelly odours and leave their homes sparkling we stock an extensive range of wholesale cleaning products for use around the home. Here at Harrisons, you'll find all the cleaning products and equipment needed to keep on top of running and cleaning a busy home. Helping to get rid of smoke, cooking, pet and other common odours found around the house we stock a range of wholesale air fresheners that guarantee to leave homes smelling fresh for days on end. Specially formulated wholesale Febreze Blossom & Breeze Air Freshener eliminates bad odours and leaves a light fresh scent, whilst wholesale Glade Air Freshener Warm Vanilla leaves homes smelling crisp and welcoming. 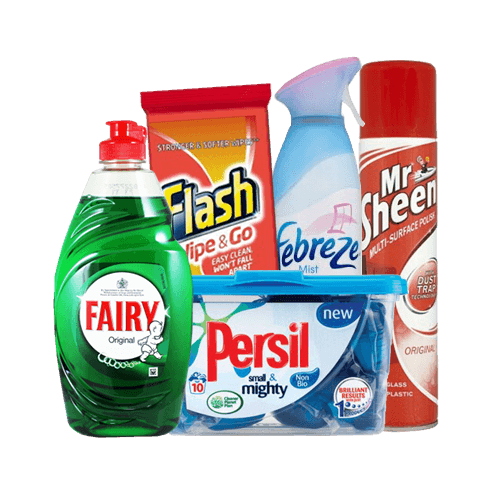 We stock a range of specially formulated wholesale bathroom cleaning products from some of the industries biggest brands. From Cif Essential Bathroom Spray to Toilet Duck Liquid Marine and Domestos Toilet Cleaning Wipes to Bloo Liquid Toilet Cleaner Ocean Mist we have a large selection of wholesale bathroom cleaning products that will help your customers keep their bathrooms sparkling clean. Nobody likes a dirty kitchen so make sure you’re stocked up on wholesale kitchen cleaning products. Helping to kill germs and fight grease we stock Crystale All in One Dishwasher Tablets, Flash Kitchen Spray, Persil Washing Up Liquid and Dettol Surface Spray. Why Buy Wholesale Cleaning Products From Harrisons Direct? With over 95 years experience in the wholesale industry, we are well known for our friendly customer care and providing a timely and reliable delivery service. Add that to our incredibly popular loyalty scheme and you’ll soon realise why so many like-minded businesses purchase wholesale cleaning products from us here at Harrisons Direct. For more information on our selection of wholesale cleaning products feel free to call us on 01254 306840.